The owners of this ebook can purchase Dark Horizon for half price. A powerfully mysterious mentalism routine with a long lasting impact. Now this second edition includes a clever additional idea by Mark Piazza. You give a piece of paper with a mystic message to an utter stranger. Later, when she is alone in her candle-lit room at 10 pm, the actual magic happens in her own hands. Your accurate prediction of her date of birth, month of birth and her chosen symbol appears right in front of her eyes on the piece of paper. The impact is so stunning that you are bound to get a call from the participant. Then you are either booked for a gig or she wants to meet you for further consultation or you are requested to start a new cult for which she is already the first recruit! In over 90 times I performed this, 87 times I received a call from the participants almost immediately after the effect happens in the participant's hands. And every time a very personal and memorable souvenir gets left with the participant along with your name and contact details. No electronics. No stooges. No pre-show. No sleights. Very easy to do and almost self-working. The best part is that the effect happens remotely in the participant's hands when you are nowhere around. All you need is some acting skill and presentation style and a BOLD ATTITUDE. When the author sent me this manuscript and when I first read it, I was totally stunned. I had to read it a couple more times to understand it in its totality. 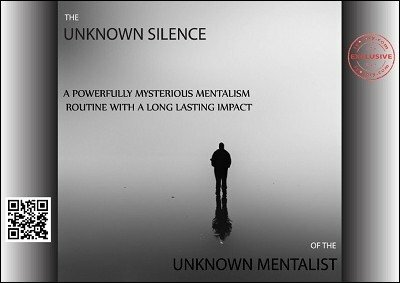 The Unknown Silence can create a chilling experience for your ‘victim’. Very unconventional, very direct, very clever routine. With almost nothing you seemingly create everything to give a stunning experience. This is way too powerful and must be used with responsibility. A potent tool for the mentalist. This is simply brilliant. And brilliantly simple. The author should not have released this and should have shared this only with me! I was very excited and wanted to try it as soon as I read it. The next day I ‘let this loose’ on a couple of my students simultaneously (I teach undergrads). And the same night both these students called me within a span of about an hour of each other. Their reactions on phone were almost hyper. The news must have spread quite fast in the class because the next day I could sense clearly the undercurrent of uneasiness among the students. I am so pleased to have this routine.